The AIM NetworkNews and PoliticsNauru – Is this a Mexican Stand-Off ? If not, it will do until one comes along ! Nauru – Is this a Mexican Stand-Off ? If not, it will do until one comes along ! There are about 119 children currently detained with their families on Nauru – this number fluctuates, as children are often taken from the island temporarily for emergency medical treatment ; many of these children were born on Nauru. Back in 2013, John Key, the then prime minister of New Zealand offered to break the Australian political stand-off and take 150 refugees each year from Australian detention centres. This offer has been renewed each year and was most recently re-confirmed by Jacinda Ardern at the Pacific Islands Forum held on Nauru in September. Peter Dutton as Minister for Home Affairs and formerly as Immigration Minister has been a vocal opponent of accepting this gesture from New Zealand. At various times he has argued that should these asylum seekers go to New Zealand they would, once having gained New Zealand citizenship, seek to visit Australia through the back-door as he calls it. An argument that he doesn’t use against those asylum seekers already resettled in the USA – under the deal struck during Barack Obama’s presidency – which has resettled 183 people, including 15 children, according to Australia’s Asylum Seeker Resource Centre. Dutton also, at various times introduces other spurious arguments including that resettling these folk in New Zealand will send a signal to people smugglers that the doors are now open to Australia via New Zealand and that the armada of vessels from Indonesia will launch imminently. Again, he doesn’t say that resettlement in the USA would act as a pull factor from Indonesia, I wonder why not ? For Dutton the continued indefinite detention of asylum seekers on Nauru and Manus Islands appears to be a major form of demarcation for the coalition to use against the Labor party and so far it has worked for the Liberals but obviously not for the detainees (who they annoyingly call transferees : when does a transferee become a detainee, is five years enough ?). Labor, sadly, have been weak and indecisive throughout, being afraid to blink and allow Dutton to deliver the wedge that Labor are weak on border protection. New Zealand have approached this whole debacle with an adult maturity that has been entirely absent in Australian politics in recent years and had we accepted the generous offer made by John Key back in 2013, all of the detained asylum seekers on both Nauru and Manus would by now be living new lives in New Zealand. In the last few days before the Wentworth by-election Scott Morrison has been bending over backwards to accommodate any policy twist that will win favour with the voters in that electorate, ranging from the desperate dog-whistling to the Jewish community to offering a glimmer of hope for the children and their parents on Nauru. Morrison has flagged his intention to accept New Zealand’s long-standing offer on the condition that the Senate passes a law banning the resettled refugees from ever gaining any visa to visit Australia. Labor have said that whilst they have not received a briefing from the government, they consider that the lifetime visa ban is “ridiculous” and not necessary to enact the New Zealand deal. New Zealand’s Foreign Minister Winston Peters also condemned the visa-ban policy on Wednesday, warning it was requiring New Zealand to create “second-class citizens” in his country, something that New Zealand would never do. So, to get Morrison across the line and have the children and their families off Nauru – we know that New Zealand officials have been preparing for the evacuation, in case the deal goes ahead – either our new prime minister has to drop his demand that New Zealand citizens (who were once asylum seekers) be banned from ever visiting Australia. Or Labor cave-in to his demand and pass the legislation which in office they could repeal. But to do so would mean that New Zealand would also have to cave-in – and agree to a lifetime ban on those settled in New Zealand from ever visiting Australia. A ban that would not affect those resettled in the USA or elsewhere we are told. So, we have a Mexican stand-off : a confrontation between two parties in which no strategy exists that allows either party to go forward or backwards. As a result, the participants maintain a strategic tension, which remains unresolved until some outside event makes it possible to resolve it. Perhaps the outside event we are looking for is the Wentworth by-election or perhaps it is the plight of the children or perhaps it is the utter frustration and exasperation of the Australian people that their elected representatives appear unable or unwilling to resolve this impasse. Meanwhile, the chief medical officer for contractor International Health and Medical Services on Nauru, Nicole Montana, was arrested, handcuffed and has now been deported from the island on Wednesday in unexplained and mysterious circumstances. It is my fervent hope that by the time this article is published it will be obsolete and that these children and their parents will be on their way to New Zealand and a new life. Then we can perhaps believe that Dutton’s log-jam has been breached and we can humanely and rationally commence resettlement of the remainder of these unfortunate people : we shall see ! This is a sad indictment for Australia under the LNP government – What it does tell us though, is that the LNP are heartless and mindless bastards. The disadvantaged in Australia can expect the same treatment every time the electorate are hood-winked into handing over power to the right wing. Yes it is a ‘Mexican stand off’. It is also a coercive attempt to win votes by Scott Morrison with no guarantees of resolution. It is a scam by Dutton where he expects to interfere with or control New Zealand citizenship and domestic policy, impose a second class citizenship on another country and allow the US re-settlement to continue without such impediment, condition or argument. Dutton is plainly clutching at his delusional and evil straws and Scott Morrison is maintaining this sick and evil stand off despite his religion and majority of Australians telling him this is plain wrong and has to stop. Both Dutton and Morrison are absurd if they think they can dictate another country’s domestic or foreign policy. New Zealand, you are an amazing country, do not acquiesce to this blackmail. Go pick these children up and ignore Australia, which needs to be taught a lesson. These children need rescuing from the clutches of Nauru, Australian illegal detention, Dutton, Morrison and the Liberal party. And shame on Labor for not being more persistent, vocal and condemning of this shameful political scam. And to all Australians every where, take a good hard look at the children in this photo… You should be thoroughly ashamed of yourselves the whole bloody lot of you! Both major parties have been complicit in the disgraceful treatment of these refugees. They have created a humanitarian crisis and should be held accountable. This shames our Nation. On a related matter, we never hear anything of the 60,000+ who entered through our front door on valid visas but who have never returned home. These folks are the REAL “ILLEGALS”. Why do we think that the asylum seekers who have suffered on Nauru and Manus, would still want to come to Australia, if they would be so lucky as to be accepted in NZ, who are we to dictate what NZ can do or not do…. How come we are told at every turn that it is solely up to the Nauruan government to determine the fate of these people yet we are still trying to impose conditions on their release? Yes, Ian Hughes, both sides are guilty; both sides must believe that only the mantra, “tough on asylum seekers”, will get you elected…. 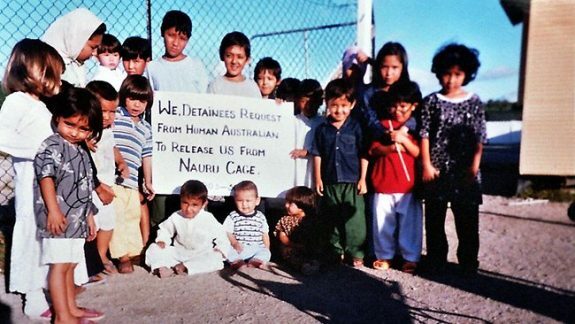 People don’t “get” the significance of the treatment of kids on Nauru. If they get away with it, they have set a precedent for the treatment of anyone else they don’t like in a similar arbitrary fashion. What concerns me is that this has become “the new normal” in our society. Governments wouldn’t persist with this sort of systemic abuse without sensing some sort of tacit approval from the voters. We had the chance to loudly object way back in 2001 during the kids overboard and Tampa days but saw the then-opposition fall in behind public (or was it media) approval and take us all down the same inevitable dead-end path. Since then they have been nothing more than vote-fodder to deflect from an absence of real policy. Several elections later and things have gotten far worse for the detainees , not better. There have been no more drownings (as if that was ever the real motive) but about a dozen deaths in custody and at least two due to boat turn-backs. We can’t outsource what was clearly our own responsibility and certainly can’t outsource morality and unlike the post-holocaust German citizens or those ignorant of the Stolen Generation, can’t later claim that we just didn’t know. The names of the perpetrators and supporters have been recorded in our history but not the victims. You know, a hundred twenty kids. Bringin them here is going to bust us? We look like Ralph Nickleby on a bad day. Australia’s shame, one that cannot be hidden under a carpet of obfuscation as was/is the treatment of First Nation people. Loss of credibility on the world stage, we can hardly take the moral high ground with other nations we consider to be less “civilised”. LNP do NOT want the boats to stop. They want them on pause while in government but are quite keen to have them take to the sea when Labor is in charge. They have always used the issue as a wedge, with no interest in the human consequences or legal ramifications. Those poor buggers on Nauru and Manus are held hostage for LNP to use as political pawns, nothing more, nothing less. Pure LNP! The emperor has no clothes, eh Max? Why would they want to come to Australia, after what it has inflicted on them ? This is just more grandstanding ! win, after what I’ve just seen in Europe I’d be heading to Germany (as my first choice): acceptance of refugees, mitigation of climate change, cheaper and fresher food. The cost of housing is unaffordable, but it’s becoming like that here too. Professor Triggs said the plan to stop those refugees ever obtaining a valid visa to enter Australia – including for tourism or business purposes – was “quite improper, illegal, manipulative and wrong”. But “if it gets them off [Nauru and Manus Island] into civilised conditions in New Zealand … then I think we have to go for it”, she said. She hasn’t said it but it is implied that a future Labor government could quite simply reverse the nonsensical visa ban. So well said, Mr Mills. The reality is that this is a political problem, a problem wholly manufactured by politicians for their own ends. There is no point in highlighting the weaknesses of their arguments, which they now find themselves hostage to. They lie exposed after decades of ‘escalation politics’, going back to Keating’s introduction of mandatory incarceration – no charge, no trial, no conviction – only indefinite detention. Robert Manne’s recent article went some of the way in acknowledging this reality, when he suggested the ‘Bring them here’ groups need to get off their ‘moral high horse’ and accept any political solution to end the madness. While his article suggests capitulation of all argument for any expedient settlement, it ignores its own premise. This is a political problem, so there is no ‘up side’ for the politicians if it is solved. Since he wrote that piece, doctors and lawyers in Australia have ramped up the pressure on individual politicians to force change. The Nauruan government, celebrating 50 years of independence (cough), have thrown any pretence of law out the window as the maths becomes clear. For every person removed from Nauru, that government loses income. The reality is that crass and vulgar. Notwithstanding Nauru’s efforts to keep their hostages, our government lives in dread of a child dying on Nauru. Not for any other reason than a child dying is more of a PR nightmare than a run of the mill refugee dying. So they continue to move the near dead to Australia, as recently as yesterday, as quietly as they can. The agreements, the existence of which our government has steadfastly and repeatedly denied (which is posed as the reason they don’t want anything getting near a court) are slowly coming out. Just as Australia paid for Nauru’s independence (cough) celebrations – and likely underwrote the PIF held in Nauru, attended by the newly minted foreign minister (cough) – we are underwriting our other partner in crime, PNG, in their hosting of APEC. What’s a few Maserati’s between friends. “The ABC has been told the AFP commitment of $48 million together with other contributions in cash and kind will exceed $100 million before the summit is held, swallowing the equivalent of one-fifth of Australia’s total annual aid budget to PNG of $558 million. As for those currently warehoused on Manus, they are getting the now customary treatment of legal abuse, stalling any legal process until their inconvenient existence, for no other reason than political expediency, is eradicated by their less inconvenient death. At the supreme court hearing in April, the PNG government sought a dismissal of compensation claims and Ben Lomai, lawyer for the asylum seeker group, said he understood a decision had been made but not delivered. This barbarity is condemned by the UN, condemned by human rights groups, condemned by NGO’s, condemned by other governments and is condemned by ordinary people around the globe. Even some churches, the previous stalwarts of child abuse, are condemning the barbarity. The pathetic agreement made with the US specifically excludes Iranians, amongst other groups in the cohort we have imprisoned on our island gulags. The proposed agreement with NZ seeks to manufacture a ‘political’ problem rendering it untenable. Australia will only give its assent (which we claim not to have or need) if NZ creates a second class citizen. How can you ask any country to grant citizenship then deny a fundamental right of citizenship (the right to free travel)? Yet one more political problem is created for an issue that is of their own making. It is of little consequence that attempts to shame the shameless are being launched. “Woah! What an amazing response! “I don’t want to sell a product, I want to tell this important story, to make a public service announcement that is surely above partisan politics. Local councils and state governments have already said they will take the refugees. Local support groups have already said they will facilitate the transition. Local communities have already demonstrated the success of programs, even when the government removes people in the dawn of a new day. Yes, those hostages to Dutton’s political ambitions from Biloela are still the subject of concerted action by their neighbours for that (now infamous) idea of the ‘Aussie Fair Go’. No amount of facts, figures and evidence matters. This is a manufactured political problem, the sort this craven government creates on an hourly basis. ‘Unity Week’ is from the 20th to the 27th October, with national ‘Walk Together’ meetings scheduled for the 27th October. In a few short days we will undoubtedly hear from politicians which carefully orchestrated events they will attend, so gobsmacking is their hypocrisy and so galling is their stupidity. Having last week signalled that he would accept the New Zealand resettlement offer, Morrison has gone quiet and it seems that only a loss is Wentworth will maintain the pressure. The sad reality Mr Mills is that this by-election will not alter anything one iota. Scummo has spent his tenure to date raiding the makeup department, the wardrobe department and the props department in search of any cosmetic alteration to make his visage palatable to ‘the punter’. His failed ‘marketing guru genius’ limits his capacity to address any problem as other than an ‘image’ problem. To hell with the substance of anything. We now have decades of practical experience with politicians generally. Anyone who has any expectation that a ‘pre-election promise’ is anything other than a meaningless platitude is not delusional, they are in need of serious psychiatric attention. It is timely, in a grim and morose sense, that there is indeed a Mexican stand-off brewing in real life and that it impacts Australia. The ‘Duck à l’orange’ was famously going to build a wall on their southern border to stop ‘the unwanted’. Shortly after, he entered a deal with our last PM to ‘swap’ their ‘trash’ for our ‘trash’. We have accepted three ‘loads’ to date and the one’s he has accepted were subject to ‘extreme vetting’ to excise Iranians, amongst others. Where this is getting nasty is that the orange idiot has ramped up the numbers moving north from Central America. Mexico now has a ‘stand-off’ on the southern and northern boarders. If the flow into Mexico increases, any rudimentary study of the sciences will tell you of ‘increases in pressure’ needing an increase in ‘emergency valves’. ““They destabilise our country, wreck our economy, and protect the corrupt, who keep all the money the US sends. We don’t care if they stop the aid – we never see any of it,” he said. What are the chances that we will accept more refugees from the America’s to boost our humanitarian credentials, with no reciprocal onus on the orange idiot to relieve the suffering of those in our gulags? As an aside, does anyone know if the ‘back door caveat’ demanded for any of the poor souls going to NZ applies to those already relocated to America? The by-election will change none of this. The ‘outcome’ will be the subject of forensic analysis for a few days, recriminations will bounce all over the place, there’ll be ‘mea culpa’s’, lots of snarling and spitting. Then Banana’s will announce his ‘run’, Ruddock’s vile persona will hit the news, etc, etc, etc. Scummo’s hypocritical apology to the victims of institutional child abuse, slotted for Monday, will appear as a bi-line. And nobody in the elite squad of the Canberra Press Gallery will dare question Scummo’s ongoing institutional child abuse, onshore or offshore. We ratified OPCAT, but there isn’t a snowball’s chance in hell we’ll ever enable it.